Authoring ELT books and digital content. Students embarking on a programme of study often need motivation and a degree of learner independence to study successfully. 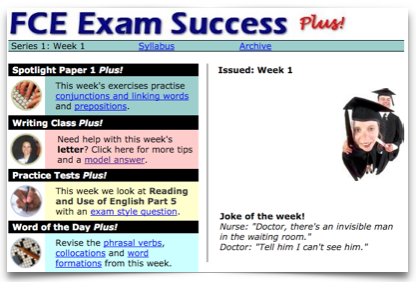 Flo-Joe developed Exam Success Plus to help Cambridge exam students stay focussed and organised throughout their exam preparation. We have taken our expertise in online learning and our experience of working with exam students, and produced a course that comes in a convenient week-by-week programme lasting three months. I am very pleased with my FCE Exam Success Plus, you are a genius!!! Thank you for doing this hard job for all of us wanting to pass our exam. Last weekend I signed in your course and I must tell you that this is the best place for preparing for the CAE. The Exam Success Plus sites are really amazing and they show how much you care. THANK YOU AGAIN!!! and I think I say it on behalf of a lot of worried students that found a new approach to learning and the support and practice they were looking for! !